cakegirlamb These were great as party favors & the sound was better then some train whistle i had looked at. Mommyluv I tested one and it worked fine. You don't put your mouth around the whole whistle just over the circular opening. My almost 3 yo cant make the whistle blow that way, but he makes it work by putting his upper lip over the top of the cicular opening and the bottom lip over the bottom edge of the square tip. The sound isn't as loud but it works. Overall the sound is a muffled low pitch whistle sound. It works for us. 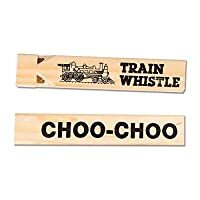 I had bought the same wooden 4 chamber one with a Thomas the train wrapper around it which made the whistle price marked up to $4 each and a plastic 3-4 (?) chamber one (louder higher pitch sound) from a local US Toys store to test 1st, and he like the wooden one better. (He was told Thomas wasn't going to be on the wooden one but he still chose it...not sure if he understood when he picked the wooden one over the plastic one). Both were found on this website at the time of purchase. With the plastic one, because of the way he placed his mouth to make sound, he would only cover 1-2 chambers so the sound was even a higher pitch sound then when I blew it. The wooden one sounded more like a train whistle (muffled lower pitch). Shash4Life I figured these would be chinsy and was fine with that considering the price. When I recieved them, i was shocked! They are great quality and work wonderfully. They will be for my sons 2nd birthday party in october. He literally just starded learning to blow bubbles and what not and only took him two tries to blow a great sound fro the whistle. Very cool train sound but not too loud to get obnoxious. LOVE LOVE LOVE these whistles!! weaziefaye I figured these would be chinsy and was fine with that considering the price. When I recieved them, i was shocked! They are great quality and work wonderfully. They will be for my sons 2nd birthday party in october. He literally just starded learning to blow bubbles and what not and only took him two tries to blow a great sound fro the whistle. Very cool train sound but not too loud to get obnoxious. LOVE LOVE LOVE these whistles!! AnneOnAMountain These are very nice whistles and they make a great train sound. I checked each whistle as I had read other customer reviews saying some of their whistles didn't work. 42/50 of my whistles were perfect. I would order a few extras to compensate. At this price, you can't beat it! dpnovak I'm a music teacher. I bought the 8-pak after reading reviews that some whistles didn't work. Of the eight, two were DOA, two others worked partially. Four were excellent. The whistle has four tone chambers that sound great when all are working. Construction seems hurried on some of the flutes rendering some chambers inoperable. Reminds me of buying Sax reeds... some are good some are bad. Even with the quality control issues - still a great price for the good ones. Definitely buy at least 25% more than you need to have enough. AidenShonsmommy It's much bigger than I thought it would be, but cute! My 2 year old can't blow it because his little mouth can't cover the hole, but he loves when his mommy & daddy blow it or he likes to pretend to blow it. betxy112 I used these as a party favor and the kids loved them. I had kids ranging in age from 2-5 and all liked them. The only draw back is the younger kids need instruction from adults to be able to get the whistle to sound. Once they figure it out, they love it though. 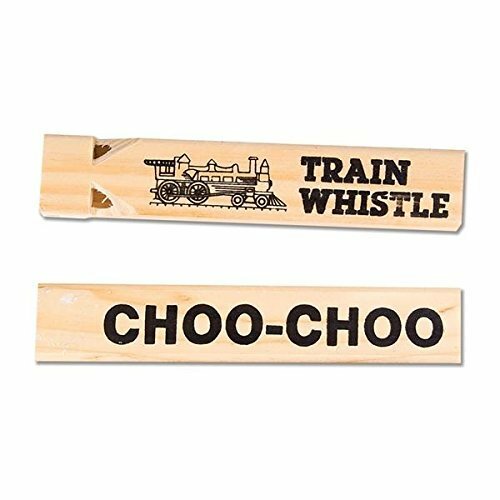 It was a little harder to get these to sound than other wooden train whistles I've seen, but they were fun none the less. I only wish they could have been cheaper for those who have to purchase favors for a lot of kids.